I was out participating in the Phoenix Area Aquatic Bird Count in mid January, and after several hours of focusing on area ponds and canals in Maricopa (Pinal County), a non-aquatic bird caught my eye. From a distance it looked a bit like a large ground dove or Inca Dove. But something wasn't quite right. When I trained my binoculars on it I saw a balled up Burrowing Owl. 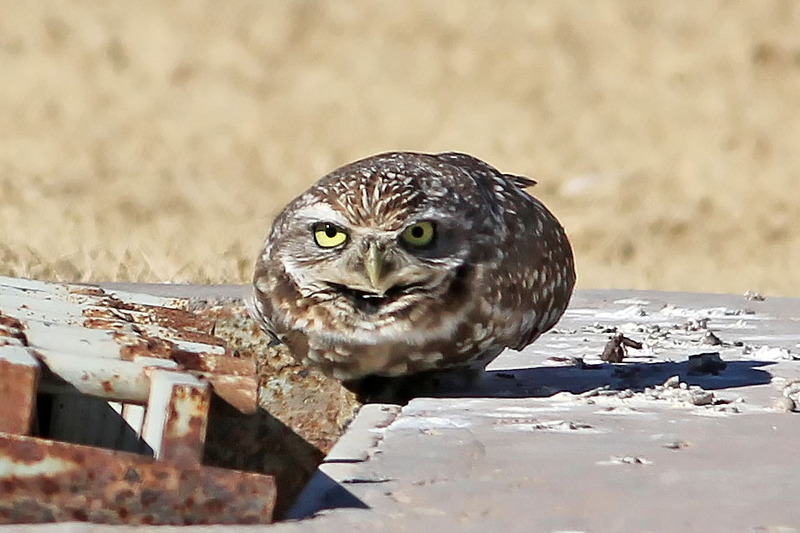 The Owl was sitting on a drainage grate that diverts storm water into a grassy retention basin. The grate was askew, so presumably it is using this man-made structure as its home. Since moving to Arizona I have been surprised at the places that Burrowing Owls turn up. Owls are generally reclusive or retiring species, and overall Burrowing Owls are on the decline. But in Maricopa, I've seen them at a gas station, in my yard, in nearby farm fields, and numerous in some of the defunct/bankrupt half-started sub-divisions. This owl was in a small park with a pond and children's play equipment. I'm especially surprised at this one and the one by the gas station since those are both locations with lots of human activity.